Apparently, he was screaming the ENTIRE day while I was at work. My poor wife was frantic when I got home. It didn’t help that the second I walked in the door he smiled ear to ear and ran into my arms laughing and giggling. Of course that lasted only for 15 minutes. Then he started screaming again. So I kept him busy while wifey cooked dinner which was a wonderful surprise. (she made a favorite, chicken picatta) too! 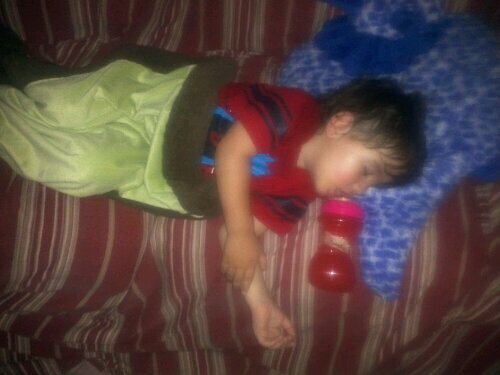 Finally at 6:00 p.m. Tantrum Tot laid himself down on the sofa with his sippy cup. I ran and got him a Melatonin and he passed out two hours earlier than usual. The picture above is how he looked once he passed out. My poor wife was overloaded and defeated. We ended up turning in early so she could decompress and get some rest. This morning, Tantrum Tot was up before the sun. I’m staying home to let my wife get some sleep. But he’s going to day care today! When my wife was first diagnosed with Asperger’s Syndrome (AS), a few things became clearer to us. Like why she has difficulty with accomplishing tasks such as cleaning or paying bills on time. And her hyper sensitivity was finally explained which shed new light on the noise levels she couldn’t tolerate and the cleaning supplies she couldn’t inhale etc. And it finally explained my wifes inability to make friends and/or socialize, leaving her lonely and desperately waiting for me to come home each day to interact with. I had reached out to the local autism advocacy agencies here in our current state, and found out they only offered woefully inadequate services and nothing practical at all. Counseling and literature is the extent of the services they offer. Woo freaking hoo. I mean those have their place, they do, but let’s explore this a bit shall we? If Aspies have trouble socializing, then making them go to counseling with a complete stranger is a bit daft don’t you think? What reason would they have to go sit and talk to a complete stranger about something so personal? Not to mention, in this case, the stranger was located over an hours drive away, and had no evening hours available, (and what the heck is up with this state and NO ONE wanting to work in the evening or on weekends anyway ?? ), so a spouse (mainly me), would have to take a day off work to accompany them. Aspies don’t like interruption to their daily schedules, which can cause panic and anxiety…didn’t the doctors who helped develop this advocacy program take that into consideration? They offered very little on the whole financial aspect. They offered financial counseling. My wife can PLAN with the best of them. She can design a budget like no ones business. The problem comes when she has to actually execute or stick to the budget. Again you can talk this issue to death but what about some practical assistance such as people who can actually work with you and pay your bills for you? (using your money of course). They seem to have people to do this for the elderly, but can’t make the jump to offer it to people with ASD. (Autism Spectrum Disorder). Financial stability can go a long way in helping people on the spectrum keep their peace of mind. Not having to worry about whether the utilities are going to stay on or not because you forgot to pay them, or double paid one bill (again), and ended up being short for another bill (which happened with surprising regularity in my house), would be of tremendous benefit, and could significantly reduce the amount of stress in an ASD household. Finances are one of the largest sources of stress in any household, but when a partner/spouse has ASD, it significantly increases the chance for meltdowns, which in my house are to be avoided at all costs. In this state, there is huge business in cleaning services. Yet they offer no help, be it financial or just retaining a company which the state would pay for, that could come once or twice a week to help clean houses for people with ASD. This would/could be a tremendous help to keep order in a home. And if things are kept in order there is less of a feeling of chaos which helps keep people calm. I know in my house, this would be of tremendous benefit to both me and my wife. I’m willing to bet we’re not alone here on this right? My wife was not diagnosed with Aspergers Syndrome until after the birth of our third child. I am forty years young and she is close behind me. Our oldest is a new teenager chronologically, but that’s about all. He helps his mother with the baby during the day, but housework is not something either of them can really devote their full attention to during the day. When I come home after work, and on the weekends, most of my time is spent cleaning. In between trying to make sure I take my wife out somewhere so she doesn’t have to spend all week staring at these four walls again. Having a cleaning service come in to do some deep cleaning and/or some maintenance cleaning during the week would be of TREMENDOUS assistance in or house. Please tell me I’m not alone in this? And finally, a program that would pay partially or at least pay for part-time day care for toddlers and infants would be pure gold. A chance for my wife to write, or straighten up, or rest or be able to go to Barnes and Nobles, to have a grande mocha frappuccino and breath in peace would increase her quality of life one hundred fold! Any other ideas out there? I’m sure there are so please feel free to share them on this post. I’m actually considering sending something to the governor on this topic. So any thing you can offer would be appreciated. I live in a house which is dominated by Aspie’s and Aspie’s who all have fascinations with soft feeling things no less. (Due largely in part to hyper-sensitivity issues). For instance, when Aspie Teen was about two, he went and hid in our bedroom closet. About a full minute later, he came out holding my wife’s blue and green silk nightgown against his face like Linus from the Peanuts gang, his eyes wide open. He stood and there and proclaimed “MOM…it’s MAGIC!” And from that moment on my wife lost custody of her nightgown. That obsession hasn’t lessened in all these past eleven years. When Aspie Monkey Boy (the middle boy) was a baby, he received a very soft fluffy baby blanket. He would not lay on anything else besides that blanket from that point on. Not only that, but I couldn’t stop the wifey from taking it every chance she got. Eight years later, Aspie Monke Boy will still go through the stores on shopping trips, rubbing his hands and face against soft items as he goes by. For Christmas, Mrs. Aspie Writer got a plush purple fuzzy robe, a plush purple blanket, and VERY plush, VERY soft, fuzzy blanket that she loves to wrap around her entire body at night. (Are you sensing a recurring theme here?) Nothing else I got her this year holds a candle to those three things. Last night, Aspie Baby climbed up on the bed where mommy was cuddled up in her two blankets. He stripped out of his soft fuzzy one piece footsie pj’s, snuggled up beside his mommy, pulled the VERY soft purple blanket around him, being very careful to leave some to rub his face against, and started watching Smurfs for the 15th time that night. (I’m starting to sing the Smurf melody in my head at work now, thank you very much). I personally don’t get the fascination. As long as it’s not too scratchy, I can sleep on it, wear it, whatever. However, Mrs. Aspie Writer can’ even try it on, if it doesn’t first pass the touch test. As you may imagine this can get very frustrating for me. How many clothes out there are THAT soft really? Especially prior to buying them and having them go through the wash with fabric softener a few times? And you can’t buy anything online because of this. The result is when we go shopping for clothes with my wife, (and believe it or not I like to go clothes shopping), it ends up being me pointing out outfits and her touching them and giving me “that look”. “That look” is a combination of “what are you thinking”, “are you nuts” and “no freaking way mister” all rolled up into one sarcastic semi-belittling look. Now it’s not always ” that look”, sometimes it’s just a matter of our tastes clashing, or her not seeing herself the way I see her, and not being able to picture herself wearing something that I’ve pointed out. We’ve done this for so long now, I KNOW what the issue is most of the time and most of the time, she will remember to tell me what the issue is with a piece of clothing. I believe my brain would melt and you would find me in a fetal position sucking my thumb and drooling. Now our side of the story…We may be at work or school all day dealing with a myriad of things that really push us to the limits of our understanding, patience, will to live etc. We may work in a factory where our senses are bombarded all day or a busy office where the phone rings all day and the constant flux of foot traffic through our domain irritates the living s** out of us. At my job I supervise eight people. Our department has CONSTANT traffic through it. The doors are all locked from the inside and we have to get up and open them everytime someone wants in. My staff CONSTANTLY come ask me quetions about every little thing. My ADD brain is TRYING to focus on what I’m doing but I get interrupted constantly. Some of us may work in customer service industries which is one of the most trying places to work. We have to deal with all sorts of people from nice one’s who are a pleasure to ones that we want to follow and attack from behind. Tt the end of the day, all those things are external and we possess the ability to block it out to some level of success, but it’s VERY tiring and exasperating for us as well. It’s exhausing mentally and physically. And then we come home to have to be dad, husband, honey do-er as well. We know you’ve been run through the mill all day. But so have we. When your partner gets home…give them 20-30 minutes to unwind. Then pass the reigns over to him and get out of the house for a while. Partners who are left behind: let them go! They need time too! Come together later and discuss the challenges you went through that day and how you felt going through them. This will help both sides understand what they deal with on an daily basis, and create more empathy for each other. Aspie’s don’t lack empathy after all…they crave it. As for the fuzzy-ness. After dealing with all that stimuli can I blame my wife for using the fuzziness as a comforting tool? Of course I can’t. AND I might add that since she’s gotten the blankets, she’s sleeping more deeply and more peacefully than she has in YEARS. Unless of course Aspie Baby wakes up. LOL. We all need comfort. We all use different things to bring us that comfort…food…drink…distractions like books and tv’s or movies and music. At least with a good fuzzy blanket they can still snuggle you while simultaneously being wrapped in their fuzzy goodness.